Fulton, Md. 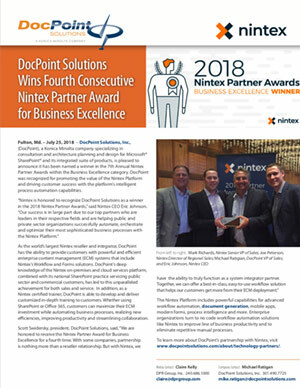 – July 25, 2018 – DocPoint Solutions, Inc., (DocPoint), a Konica Minolta company specializing in consultation and architecture planning and design for Microsoft® SharePoint® and its integrated suite of products, is pleased to announce it has been named a winner in the 7th Annual Nintex Partner Awards within the Business Excellence category. DocPoint was recognized for promoting the value of the Nintex Platform and driving customer success with the platform’s intelligent process automation capabilities. As the world’s largest Nintex reseller and integrator, DocPoint has the ability to provide customers with powerful and efficient enterprise content management (ECM) systems that include Nintex’s Workflow and Forms solutions. DocPoint’s deep knowledge of the Nintex on-premises and cloud services platform, combined with its national SharePoint practice servicing public sector and commercial customers, has led to this unparalleled achievement for both sales and service. In addition, as a Nintex certified trainer, DocPoint is able to develop and deliver customized in-depth training to customers. Whether using SharePoint or Office 365, customers can maximize their ECM investment while automating business processes, realizing new efficiencies, improving productivity and streamlining collaboration. The Nintex Platform includes powerful capabilities for advanced workflow automation, document generation, mobile apps, modern forms, process intelligence and more. Enterprise organizations turn to no code workflow automation solutions like Nintex to improve line of business productivity and to eliminate repetitive manual processes. To learn more about DocPoint’s partnership with Nintex, visit www.docpointsolutions.com/about/technology-partners/. DocPoint Solutions, a Konica Minolta company, is a Microsoft Gold Certified Partner specializing in implementing, training and supporting Microsoft SharePoint and its integrated suite of products. With a focus on enterprise content management (ECM) and document capture, the company provides comprehensive consultative services and support to a wide range of federal, state and local governments as well as private and commercial enterprises seeking to maximize the value SharePoint brings to their operations. By combining state-of-the-art solutions with document management expertise and innovative approaches to systems design and integration, DocPoint helps clients attain new levels of effectiveness and productivity. An affiliate of Quality Associates, Inc., DocPoint is headquartered in Fulton, Maryland. For more information, please call (301) 490-7725 or visit www.docpointsolutions.com.